Tracing the life of Zarina Bhatty, a Muslim woman born and brought up in pre-Partition India, this memoir narrates the experiences of a woman who strove to break out of the stereotypical roles imposed by the society of her times. It chronicles her life over 80 years, portraying the political and social conditions of undivided and post-Independence India. Zarina’s story is a story of grit, perseverance and determination to battle against all odds —a story that was waiting to be told. The title of the book is very apt, literally and metaphorically. 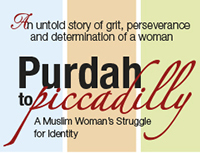 The book follows the journey of a Muslim woman’s struggle for creating an identity in a world where a woman herself is a non-entity… There are two of looking at the narrative. One, how right from her childhood Zarina challenges the norms and rules of the society prevalent in her time. Another perspective would be how Zarina became a crusader of her own cause.